Have you ever been some place and been forced to put your purse on the floor for whatever reason? Or, worse yet...you are a mom like me and you have to change the baby's diaper in a public restroom on one of those diaper changing tables that folds out from the wall. There really is no place to put the diaper bag within reach. Well, because this is a Valentine's Day Gift Guide post we aren't going to talk about diaper bags and changing tables...we are going to talk about going out to eat. So, you are at the restaurant and you are on a date with your Valentine. You sit down and look for a place to put your purse. If you are like me, you sling it over the back of your chair or put it on a chair next to you...or, on the floor. I hate the latter of those choices because we all know how filthy those restaurant floors can be. Well, I have a solution...thanks to this next company and yes (listen up men! ), this product will make your Valentine very happy. Today, I am going to introduce you to the Clipa...the Handbook Hanger. 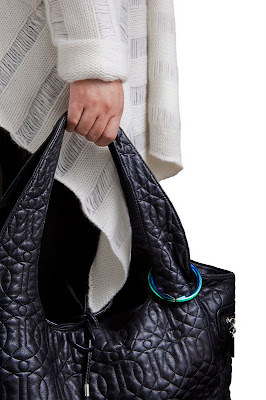 This product is designed to keep your purse or bag off the floor and within arm's reach. It also doubles as a beautiful bracelet! Clipa is a product that is manufactured by Topcor, a company based out of California. This company also manufactures other innovative products to help make life easier and less complicated. They also like to focus on "out-of-the-box" ideas for new products...which is great! So, for this review I was sent the very beautiful Polished Silver Clipa to try out and share with all of you! There is no trying to unbuckle anything, unfasten or undo any complicated snaps when using this product. All you do is open the clip (it is spring-loaded) and attach it to your purse or bag handle. It looks very stylish on there too. Then, the clip is ready to use. Using the Clipa is a cinch. Just pull it open and hang it wherever you need it to be. It can go on table edges, restroom stall doors, diaper changing tables, etc. The part that rests on the table has a nice little rubber pad that helps keep it from sliding and falling off. And, good for me to know...the Clipa holds up to 45 pounds! I tend to overload every purse or diaper bag I carry so knowing the weight limit of this gadget is helpful. :) In the picture above, my purse is not touching the ground...it had about 2 inches to go until it was resting on the floor. My only observation about the Clipa that seemed unsafe was that if you are not watching your bag, it seems easy for anyone to grab it and run. So, don't trust this product to keep your personal belongings safe...it isn't meant for that. Make sure you always keep your possessions in view. 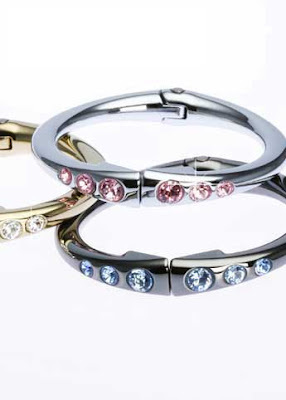 The Clipa retails for $19.99 for the solid styles, and they also offer customizeable crystal clips, and colored clips. These retail from $29.99 - $39.99 depending on style and color. So, in my opinion...Clipa is a really nifty and handy product! I love how easy it is to use and how it can simplify my life as a mom on the go. Clipa is sturdy and beautiful and adds alot of finesse and charm to any handbag as well. Great product! Disclaimer: I received no monetary compensation for this post. I did receive a free Clipa for review purposes. All quotes and stock photos are from the Clipa website and email. Prize is being provided by the sponsor. All thoughts and opinions are 100% mine. i really like the kim. that sparkle would be fun. I like the Penelope Clipa. I like the Ruby clipa. I like the Penelope clip. My favorite is catherine. Thanks for the giveaway. Internet Marketing Worked For Us! Check Out The Deals On nomorerack!